Get back to feeling normal. This comprehensive guide will help you understand what your back pain means, pinpoint where it comes from, and explore the benefits of different treatment options. 3 Is back surgery worth it? Back pain is a thief that steals your quality of life and makes everyday tasks harder. But, you don't have to suffer. There’s hope for getting back to feeling normal with customized treatment. The first step is to identify what is wrong. Our ultimate guide to back pain relief will help you recognize your problem, understand what your pain means, where it comes from and what treatments are available. Whether you’re in the first stage of research or you’ve already decided to have back surgery, this guide includes answers to common back pain questions and examples of real patient success stories. Dr. Meredith Langhorst discusses back pain and how certain types of workspaces can affect your back and add stress to other body parts. Back pain is your body’s way of telling you to slow down and notice that something is wrong. In most cases, back pain is due to a sprain or strain. Has back pain caused you to miss work? You’re not alone. The number of people suffering with back pain is on the rise. In fact, researchers at the Centers for Disease Control and Prevention cite low back pain as the second leading cause of disability in the United States, and the latest numbers indicate that an estimated 31 million Americans are experiencing low-back pain at any time, according to the American Chiropractic Association. Recovery starts when you seek help and figure out what’s wrong. Meet with a back doctor to start a personalized treatment plan to help you get back to living pain free. In some cases, non-surgical strategies can help reduce back pain, including: several non-surgical strategies that can help reduce back pain symptoms. Avoid any activities that trigger your back pain. Take over-the-counter medication, such as Aleve or Advil, as needed. If you’re using the medication to mask your pain, you might continue to damage your back. Talk to a doctor for guidance if you’re unsure. Use a heating pad/cold pack (or alternate between the two). Get a massage. Massage therapy reduces muscle stiffness and increases blood flow. READ ARTICLE: ARE MASSAGES GOOD FOR BACK PAIN? Keep exercising: Sometimes, when you have chronic back pain, the last thing you want to do is move a lot because it aggravates your injury and causes more suffering. But, even if you can’t do all of the things that you used to enjoy before your injury that doesn’t mean you have to give up staying active all together. Exercising can help stretch your back and strengthen your core. If you’re able to keep exercising, talk to your back doctor about including a low-impact aerobic activity, such as swimming or walking, as part of your fitness routine. Or, work with a physical therapist to develop a customized set of activities you can do that won’t cause additional pain. Lose weight: Doctors always recommend maintaining a healthy weight for its many physical benefits, and among those perks for some people is diminished back pain. If you carry extra weight, experts find that it often puts additional persistent stress on your back which can cause more severe and extensive pain. Most people find that losing a few pounds substantially reduces soreness because being at a healthy weight decreases the trauma placed on their spines. Nonsurgical treatment: Develop and follow a pain management plan that includes diet, exercise, physical therapy and medication. Surgical treatment: Work with your spine surgeon to determine the best surgical solution based on your specific condition and goals. Reducing most back pain symptoms doesn’t require surgery. You can use nonsurgical means and experience successful results. Sometimes, identifying and stopping any activity that is causing your back pain for a few weeks is enough to alleviate minor back pain problems. Physicians who specialize in non-operative spine care use medication, physical therapy and interventional procedures to help reduce pain and get back to your normal routine. If back surgery is necessary, pain management spine physicians can assist with back pain treatment options during the interim. Surgical emergencies for back pain are extremely rare, but they can occur. If you experience a medical emergency such as loss of bowel and/or bladder control or if you develop progressive weakness or numbness in your legs, please make an appointment to see a spine specialist right away. When is back surgery a good idea? In most cases, surgery is considered only when you’ve gone through all the nonoperative treatment options and you haven’t had significant or lasting improvement. Deciding on surgery often has to do with pain levels, the amount of disability, the length of time you’ve been in pain and what treatments you’ve already tried. Elective back surgery is always your choice. But, some back pain problems will only get better with surgery. Your back doctor will work with you to make sure you make an informed and educated decision. Have you had a spine image done at another facility? An OrthoIndy spine surgeon will review your spine MRI for free. Nerve or spinal cord compression: When your spinal cord or nerves are compressed, it can cause pain, numbness, tingling, weakness, loss of coordination or balance, and even trouble with bowel and/or bladder function. Instability: Lower back instability often results from fractures or the degeneration or aging of your spine. Your spine surgeon may have to make your spine unstable in order to relieve pressure on the nerves. Spine deformities: When your spine loses its normal shape, the result may be scoliosis or kyphosis. Surgery is sometimes used to restore the alignment of the spine. OrthoIndy Hospital was the first facility in Indiana to add the Mazor X™ Robotic Guidance System to its hospital. The Mazor X Robotic Guidance System combines pre-operative planning tools and analytics with intra-operative guidance, giving OrthoIndy spine surgeons advanced spinal surgery options. Right now, OrthoIndy spine surgeons are using the Stealth Edition of the Mazor X Robot. As one of first five sites in the world to be using this edition, OrthoIndy offers a fully-integrated procedural solution for surgical planning, workflow, execution and confirmation for back surgery patients. Hospitals choose the Mazor X System to provide surgeons with pre-operative assessment of a patient and intra-operative trajectory precision when treating that patient. As spinal surgery has evolved, more focus has been placed on minimally invasive techniques, and this is where the Mazor X System can deliver its greatest technological benefits. Surgery with Mazor Robotics technology provides increased safety and precision for a wide variety of spine procedures, and in some cases, allows for minimally-invasive surgery. If you are one of the many that suffer from a debilitating spinal condition or back pain, you may be a candidate for spine surgery with the Mazor X Robotic Guidance System. OrthoIndy scoliosis patient discusses life after scoliosis surgery. To learn more about Alyssa's experience with OrthoIndy, view Alyssa's before surgery video or Alyssa's during surgery video. Planning back surgery starts with understanding your goals. Talk with your back surgeon about what your idea of success looks like and describe your ideal post-surgery outcome. Make sure your back doctor understands your expectations for recovery and beyond. For most patients, the primary goal of back surgery is to reduce pain, increase mobility and improve quality of life. However, living pain free is just the beginning. It’s amazing how something like back pain can make the every day so much more difficult. Many find that after successful back surgery, they sleep better and their mood improves, too. Planning for back surgery starts with understanding your goals. Learn more about the pros and cons of back surgery and what will work for you. What is your ideal outcome? What are your surgeon’s expectations? What type of back surgery is your surgeon recommending and why? What can you expect if you don’t have back surgery? What are the risks? (And, what can you do to reduce those risks?) Should you donate blood for your surgery? What has happened with other patients who have had this surgery? What should you expect after the surgery? How long will you be in the hospital? In most cases, the benefits of having surgery far outweigh the potential complications or risks. As serious as back surgery seems, most people who undergo back surgery experience no complications. Modern techniques and technological advances have improved the safety of back surgery. Your back doctor will work with you to reduce the possibility of any complications. READ ARTICLE: WHAT LEVEL OF SUCCESS SHOULD I EXPECT AFTER BACK SURGERY? Be ready: Recovery begins before surgery. Don’t be overwhelmed: Download the surgery checklist to make sure you are ready for surgery and recovery. Recovery begins before you head into the recovery room. Recovery is about making sure your body and your environment is prepared to help you heal. Proper nutrition can make recovery easier. Eating health-promoting foods with the right nutrients enhances your immune system which speeds up the healing process. When you eat foods rich in antioxidants and protein, your body’s muscles mend more quickly and you’re more likely to avoid problems with infection. During recovery, one of the best things you can do to prevent inflammation is to avoid eating sugary foods and instead choose complex carbohydrates, like whole grains, that are rich in fiber. Becoming active before and after surgery provides advantages during your healing process. During recovery, your spine physician will have you move in very specific ways to strengthen your core muscles. You’ll even get specific instructions for turning in bed to avoid damage. Learn how to eat healthy, exercise, lose weight and maintain a positive outlook on life to achieve your goals. Finally, consider using your back surgery as a reason to stop smoking. Smokers have an increased risk of complications during and after surgery. Experts recommend trying to quit smoking four to six weeks before your surgery. And, don’t stop there. According to the American College of Surgeons, if you can resist lighting up a cigarette after your surgery, then you’ll lessen your potential for wound complications by 50 percent too. After surgery, you’ll be up and walking within the first 24 hours. During your hospital stay, you’ll see a physical therapist each day. He will teach you how to sit up, roll over in bed and get out, walk, stand and use a walker. Your physical therapist will also be one of the decision makers who helps assess when you’re ready to go home. You may notice some swelling. This will diminish over the next two days. Your back doctor will have you use an intermittent pneumatic compression device or have you wear compression leggings, called TED hose. Both of these help prevent blood clots while you are immobile. You know you have to have surgery, but the cost of medical expenses can be worrisome. The following tools are helpful when comparing the cost of surgery and quality of care between hospitals. First, it’s important to check with your insurance provider to ensure OrthoIndy is in your network. OrthoIndy and OrthoIndy Hospital participates in most major insurance networks. Many insurance companies have pricing tools that take into account your benefit plan. Visit your insurance provider’s website to see if this is available to calculate surgery costs. Another resource to review surgery pricing is the mycareinsight.org website. The Indiana Hospital Association (IHA) developed the website using data that is reported to the Centers for Medicare and Medicaid Services and the Indiana State Department of Health. The data reported on this website includes measures of care provided in the hospital, including patient satisfaction, readmissions, infections, deaths, birthing outcomes, hospital charges and more. According to the mycareinsight.org, spine surgery at OrthoIndy Hospital costs less than the state average for inpatient spine procedures. Nationally, OrthoIndy Hospital performs better than average for patient experience and has low hospital acquired infections and readmission rates. Visit mycareinsight to compare hospital pricing for spine surgery. DOES ORTHOINDY TAKE MY INSURANCE? What are surgical and nonsurgical options for back pain? Should I talk to an orthopedic doctor about back surgery? What level of success should I expect after back surgery? Are there ways to speed up back surgery recovery time? What is cervical myelopathy (spinal cord compression)? What is a fractured spine? Are massages good for back pain? 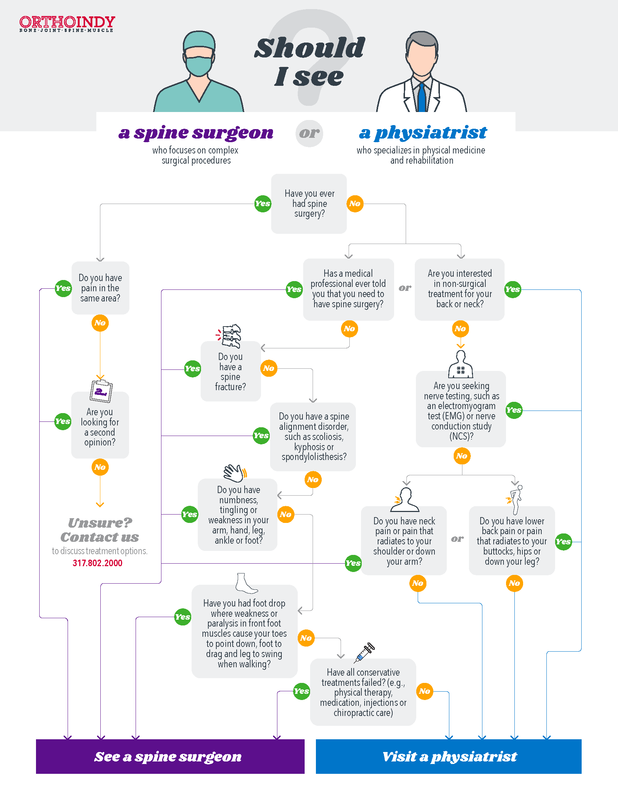 Spine surgeon or physiatrist: who should you see? Justin Ochoa is an active father, husband and personal trainer in Indianapolis. When back pain began to hinder his job and overall quality of life, he knew it was time to seek help. After landing on her neck during a gymnastics routine, Madison had neck surgery at OrthoIndy and returned to gymnastics less than six months later. Sue Arnold has worked with the OrthoIndy doctors through back surgery and multiple injuries to get back to a normal life.